january 2008, 12 new models of blythe dolls licensed by hasbro will be on the market!!! "In 1972, an extraordinary event took place; a unique new doll appeared on the scene. She had a kooky, kicky look, and each time you pulled her string her eyes would change color and she would "look" in a different direction! Her name was BLYTHE™ and those lucky enough to add her to their collection knew they had a doll like no other! 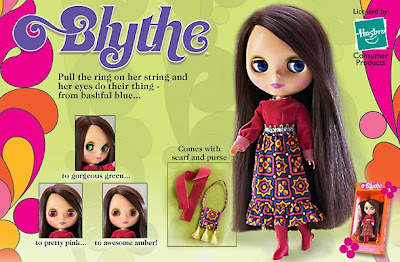 But, then BLYTHE dolls disappeared from the fashion doll world after a single year! Now, the long awaited third collectible doll replica with brunette hair and red patterned reproduction dress design is here! What an opportunity for collectors! Today, original BLYTHE dolls sell for thousands of dollars on the secondary market and collectors clamor for her the world over." You can get the Ashton Drake ones pretty cheap on Ebay too, even MIB. They aren't as popular as the Takara or Hasbro Japan ones. My daughter (4) loves playing with my Blythes. lala told me the ashton drake's have better hair for a little girl + the takara's have tangley hair (i like their wild hair colors though). Thank you! It was nice meeting you too! I finally listed that Pirate blanket BTW, but the photo doesn't do it justice. I can't believe the huge Blythe revival that's been going on. I always wanted one when I was a kid. However, I seem to remember that you'd push her head and the eyes would change, as opposed to pulling a string. But I could be very wrong. I bought my daughter and ashton-drake to see if she would like it. Keep in mind these are collectibles, and not toys to be played with. Buying her was the biggest mistake of my life. She is made fun of all the time because kids think she is "creepy". It's no wonder why they stopped producing her in 1972. I am also on flickr. The girls and boys there, go through alot of heartake being made fun of, they post about it all the time. They are also in there teenage years. And the ashton-drake has the worst hair ever! it is tangly and gets a kenner-like frizz. Takara's are the good ones. ADG'S also have a green-skin tone, and and sbl looking face, but rounder. I just can't bear seeing kids getting hurt in school for a doll, if they aren't ready. i heard takara's have the tangley hair + ashton drake's have nice hair, so i'll have to see for myself.